La Bottega di Luca is set to please discerning palates with traditional Italian food and wine in a beautiful setting. This bright restaurant is situated on the second floor of The Terrace 49 building on Sukhumvit Soi 49 in Thonglor, Bangkok. 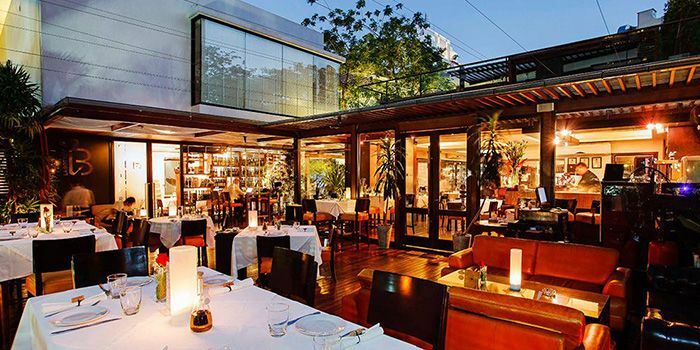 La Bottega has a cozy indoor space adorned with wooden floors and warm walls, and boasts an amazing outdoor terrace furnished with leather sofas and high tables where guests can escape Bangkok’s busy streets. There is also a private dining ‘wine’ room available for up to 14 guests. Menus are not interchangeable, unless otherwise customer notify us of any dietary requirements and allergies on the booking form. Customers are welcome to order any additional side dishes, drinks when dining. Diners will need to pay the full amount at the time of booking. Deposits are non-refundable. Changes of time and date are possible with a minimum of 24 hours’ notice. Chef Luca Appino’s habitual research trips back to his homeland result in some of the best seasonal Italian produce that Bangkok has to offer. These are put to good use in dishes that are refined yet authentic in flavor. Chef Andrea Ortu heads the kitchen these days, wielding his influene in unbelievably creamy and rich risottos, decadent slow-cooked beef and to-die-for lemon curdstuffed crepes. To drink, the cellar comes equipped with some of the finest Super Tuscans around.